Massive by name and (for the most part) Massive by nature, NI hasn't lost the knack for producing top-drawer synths. Well-designed interface. Clever modulation system. Relatively easy to get to grips with. Great filters and oscillator. Absolutely feature-stuffed. Some lacklustre presets. Not the cheapest. It's easy to coax great synth sounds out of Massive. The Routing page enables you to check on your signal's flow. Massive is a hybrid synth that combines ideas and influences from all over the place. What's more, it's one of the most feature-packed synths we've ever encountered. In fact, it seems to be an attempt to present the sort of power and flexibility you'll find in the likes of Absynth and FM7, but with a more accessible interface and an altogether different engine. Massive's main page is reassuringly simple, and most of the commonly used controls are right here ready and waiting for you to start tweaking. For the most part, the layout is very straightforward, with the left-hand strip of the GUI being home to the three oscillators and an extra modulation oscillator, as well as the noise and feedback controls. The oscillators are slightly unusual in that you can morph from one waveform to another via a dedicated knob (rather than them being a single, static shape). The default wavetable oscillator shape is called Square-Saw I, so when the wavetable position knob is turned hard left, the oscillator emits a square wave. Gradually rotate the knob to the right, however, and it turns into a sawtooth. You can choose from 82 wavetable oscillator shapes, ranging from simple waves to more sophisticated vocal effects and metallic noises. Each oscillator also features an Intensity control - akin to a low-pass filter - and a control for panning the output between Massive's two filters. The filter section is located to the right of the oscillators and can be set to function in serial or parallel modes or in a mixture of both (via a crossfader). 11 filter modes are available; as well as the familiar two- and four-pole high- and low-pass filters, some more exotic ones can also be selected. These include the chunky low-pass Daft (presumably a tribute to French filter-wranglers Daft Punk), Scream (an aggressive filter with a control for adjusting its distortion component), and a comb filter with feedback and damping controls. Despite being rather posh, neither the oscillators nor the filters represent Massive's most intriguing feature. That honour is reserved for the clever modulation system, which recalls one of our favourite synths of recent years, FabFilter Twin. Rather than offering a complex, space-consuming modulation matrix, Massive has an elegant system that's not only quick and intuitive to use but also gives the user some helpful visual feedback. The system works in a very simple way. Each of Massive's knobs has one or more Modulation Slots located underneath it, and each modulation source - envelopes, LFOs and the eight macro controls with MIDI learn - has a Modulation Handle that can be dragged and dropped into any of these slots. The slot then becomes a control that enables you to dictate how much the modulation source affects the modulation destination - visual representation of this is given in a ring that surrounds the knob. As each knob has at least one modulation slot, there are millions of possible modulation combinations to discover. Despite this vast potential power, though, Massive is still one of the most tweak-friendly synths we've ever got our grubby little hands on. Massive's modulation credentials are further enhanced by the fact that each of the four LFO generators can be put in LFO, Stepper or Performance mode. In the last of these, complex, Absynth-style LFOs can be created by dragging and dropping envelope sections onto a grid, making up a repeating, rhythmic modulation source - perfect for trippy arpeggiated riffs or evolving ambient textures. There are also four envelope generators; these are far more advanced than your average ADSRs and feature unusual morphing functions that enable you to create even more sophisticated modulations. There's no need to be intimidated, though, as both LFOs and envelopes are easy to work with. 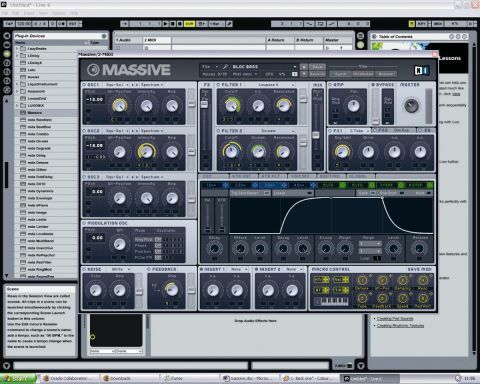 Massive is a synth that offers an embarrassment of riches. Thanks to its overwhelming array of wavetable oscillators, well-thought-out modulation options and bountiful filter and effects sections, it successfully bridges the gap between instantly gratifying virtual analogues and more complex and elaborate synths like Absynth. The only real drawback is that, in the main, the supplied presets are pretty dreary. A few of the (relatively meagre) 420 supplied patches show off Massive's power, but many are uninspired and dull. These days, we expect more from our preset banks. Poor presets aside, though, Massive is a great synth that will appeal to both less experienced synth programmers and seasoned pros. It gives you those big Native Instruments sounds but without the associated programming headaches, and that's got to be a good thing.